Welcome to Part Two of my "Science Fiction Through the Centuries" series, where I talk about early science fiction stories... and where you can find them. 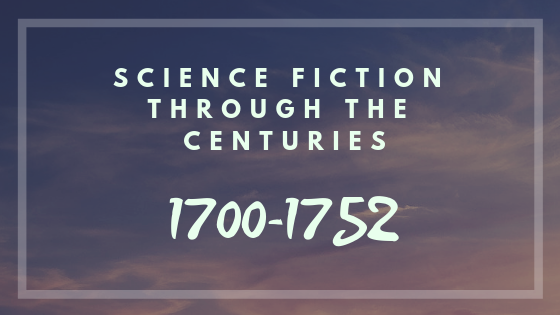 You can read the series introduction here: "Science Fiction through the Centuries - The 1600s"
This month, we're looking at early science fiction works written between 1700 and 1752. Yes, that's an arbitrary year to choose, but the number of stories written between 1700 and 1799 was much larger than the one for stories written between 1600 and 1699, and I had to pick a point somewhere to stop before this post turned into a book of its own. *Quick Note* - There's been a ton of concern lately about book piracy and where to find legitimate copies of an author's work. Before we dive in to today's list, I wanted to reassure you that I am doing my best to make sure the links I've provided do not take you to websites with pirated material. Written by the author of Robinson Crusoe in 1705, The Consolidator is part science fiction, part fantasy, and part satire. Drawing inspiration from political conflicts going on within the British government in 1704, Defoe sends his narrator to moon by means of a consolidator (a chariot with two feathered winged creatures, in case you were wondering). From this vantage point, the narrator is able to look at what has been happening within British Parliament with an impartial eye. Originally published anonymously under the title Travels into Several Remote Nations of the World, this classic satire and travel narrative parody details some of the adventures of surgeon and sea captain Lemuel Gulliver. There is a lot of debate over whether or not the work qualifies as science fiction, but those who argue for it point to the utopian and dystopian elements incorporated into it. Written seven years after Gulliver's Travels by Irish Anglican clergyman Samuel Madden, this novel is set in the late 1990s and was written as a series of diplomatic letters written by British diplomats appointed to Paris, Rome, Moscow, and Constantinople. Jesuits are the dominant world power. Its focus is the political and religious state of the world, not technology, which makes it an early example of social science fiction. Madden published this work anonymously, then had most copies destroyed shortly after - making it more difficult to locate now (but not impossible). The only novel written by Norwegian author Ludvig Holberg (originally in Latin), Niels Klim's Underground Travels is considered to be satirical science fiction/fantasy. Set in Bergen in 1664, Klim investigates a strange cave in a mountainside above town and falls down a hole that takes him to the utopian state of Potu. The novel details his adventures in Potu and his subsequent return to Bergen. This science fiction tale was written by German astronomer and translator Eberhard Christian Kindermann. Prior to The Speedy Journey, Kindermann published a nonfiction work filled with his speculations about Mars having at least one moon in orbit. In this story, he uses his previous writing as the underpinning for an outer space adventure that sends five people to Mars in a sail-driven balloon. There, they discover a race of god-like humanoid aliens. Some argue this is the first example of proto science fiction in the German language. Although the original German versions fall under public domain, it was not very well known outside of Germany, and did not receive much attention until much later. Dwight R. Decker published an English translation titled The Speedy Journey in 2014. Part shipwreck tale, part space adventure, this story was written by an unidentified author using the pen name Ralph Morris. The main character, a blacksmith named John Daniel, is shipwrecked on an island south of Java. He remains on the island for many years, having several children with a companion on the island who turns out to be a woman (how very Robinson Crusoe). Later, Daniel ventures off into space with one of his sons in a flying machine his son invented. In space, the pair encounter alien life on the moon. On their return to Earth, they discover an island with a race of monsters that are the result of interbreeding between humans and "creatures of the deep". After these and other adventures, Daniel returns to England to tell his tale. While many of the stories mentioned above have had the main characters travel to outer space from Earth, Voltaire's Micromégas is about a visit to Earth from its titular character, an interstellar traveller from a distant planet circling the star Sirius. Micromégas has been banished from the Sirian court for 800 years, so he passes the time by traveling first to Saturn, then to Earth with Saturn's secretary of the Academy. They find the inhabitants of Earth to be laughable at first, but eventually figure out how to communicate with them. In opening up lines of communications, Micromégas and his companion come to realize humans are more intelligent than they first gave them credit for. As I stated in a post earlier this week about the series, I'm not sure about how much further I'll be going with this series (read "Reconsidering Science Fiction through the Centuries" for an explanation as to why). Let me know what you think and if you'd like for me to continue.